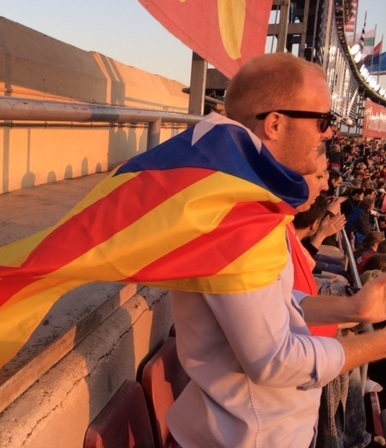 Corey Novotny, AU ’14, studied abroad in Barcelona during the spring 2014 semester. Corey Novotny, AU ’14, always knew he wanted to study abroad, and during his last semester as an undergraduate student at Aurora University, he did just that. Novotny, a double major in business and commerce and Spanish with a minor in international studies, attended the University of Barcelona this past spring through AU’s exchange program. Novotny took four classes at the University of Barcelona in three different languages: Spanish for Business, Elementary Catalan, Sociology of Global Processes and European Integration. European Integration, his favorite course, introduced him to a whole new business perspective. During the course, he learned how to create and market a brand in the European Union, and he was able to walk away with both the knowledge of how to do it, as well as the physical results of the project. This new outlook helped Novotny learn how to adjust living in another country. Because of this, he saw the exchange program as a stepping stone when he made the decision to also attend graduate school abroad. “I knew I was going to have a tryout for the soccer team at Leeds Beckett University in Northern England while I was in Barcelona,” he said. “So I went over there, saw the soccer facilities and toured the school, and everything fell into place.” He will begin pursuing his MBA and play semi-pro soccer in August. Through his trip abroad, Novotny was able to step out of his comfort zone and broaden his view of the world, all while finishing his undergraduate coursework and choosing where he will pursue his graduate degree. For more information about Aurora University global study opportunities, visit aurora.edu/studyabroad.